Everything in Darkest Hour comes together beautifully. The pacing is absolutely perfect; it is like a fat man’s running- not too fast, but definitely not slow. There are points where it slows down, but as with a spirit of perseverance that ‘never, never, never gives up’, it picks right back up. The film takes place over a very short, but extremely significant point in the life of one greatest orators of the 20th century. The Darkest Hour moves just like graceful ballet. The trackining shots and editing are seamlessly interwoven. The scenes and shots are expertly composed. There are several shots that are magnificent stills, which showcase the amazing talents of both the director and the cinematographer. 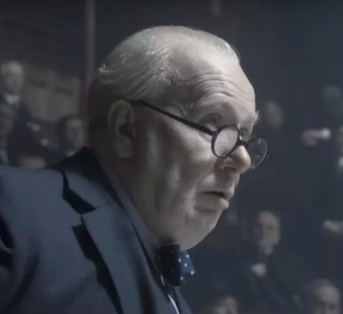 The impeccable Gary Oldman shines as Winston Churchill. Oldman gives an outstanding performance, that is better than Oscar-worthy. The film gives an intimate view of Churchill’s life. Oldman is like a cactus flower; he is nuanced in his approach- there’s a rage and vulnerability balanced with a subtle comedic charm. When he gives Churchill’s famous radio speech with all the tenacity it needs; the rousing inspiration was palpable. It is truly moving. The series of great one-liners that is the dialogue of Darkest Hour echo the essence that was Churchill. He was a great man with a great way with words. Churchill took the helm of the United Kingdom at a decisive time in history and against strong opposition from his own party. He had to make tough calls that would have made lesser men cower in defeat, but he did it with bold, unwavering conviction. Darkest Hour isn’t just another WWII film; it goes deep within the trenches of the war room and looks at the heart of the decision maker. It is cinematic masterpiece and it deserves more than nominations. 5/5 stars.